Welcome to another amazing Micro Preemie Monday. Once again, I am honored to bring you another family’s story. 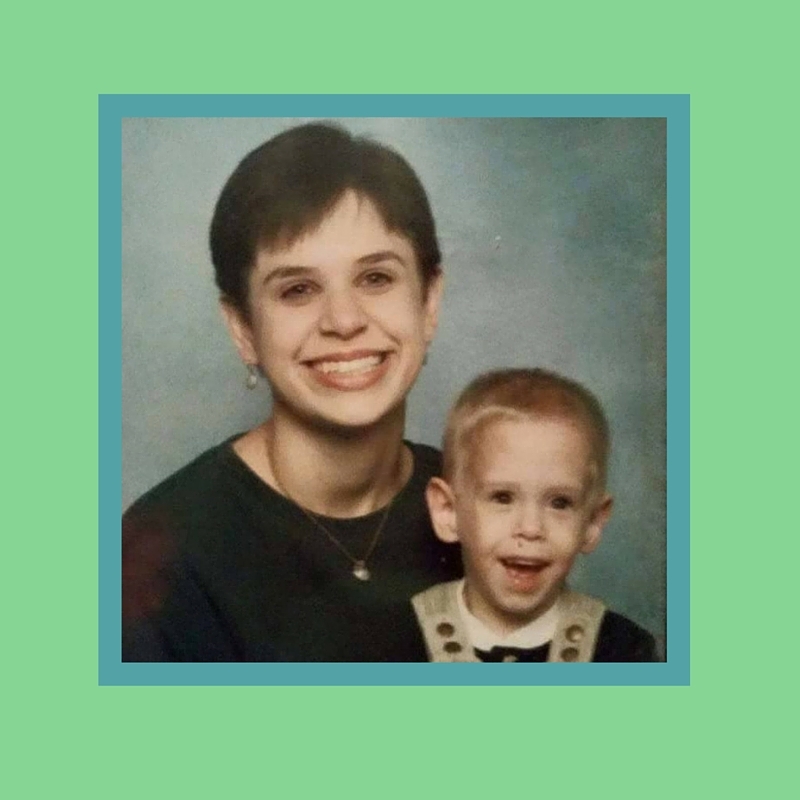 Today, we meet William, as told by his mom, Jackie. My son’s story started on June 11, 1996 in Tennessee. I went to a doctor’s appointment thinking nothing was a problem but I knew 5 minutes in that there was a problem. I had planned to deliver in Oak Ridge, TN but that day I was sent to Knoxville, Tennessee to the University of Tennessee Medical Center. I arrived at the hospital at 3 pm, and he was born via classical c-section at exactly 9 pm. I was 24 weeks pregnant, and he was 1 lb, 1 oz, 10″ long. I named him William Taylor… After my father who had passed away the year before. I was shocked he was a boy because I was told he was girl twice before he was born. He was in the NICU from June 11 th until November 3 rd. He came home on oxygen, and he weighed 4 lbs 4 oz the day he was released. I would say the hardest part for me was also the best part, looking back. I was completely clueless! I was 18, and had never been around a baby before. 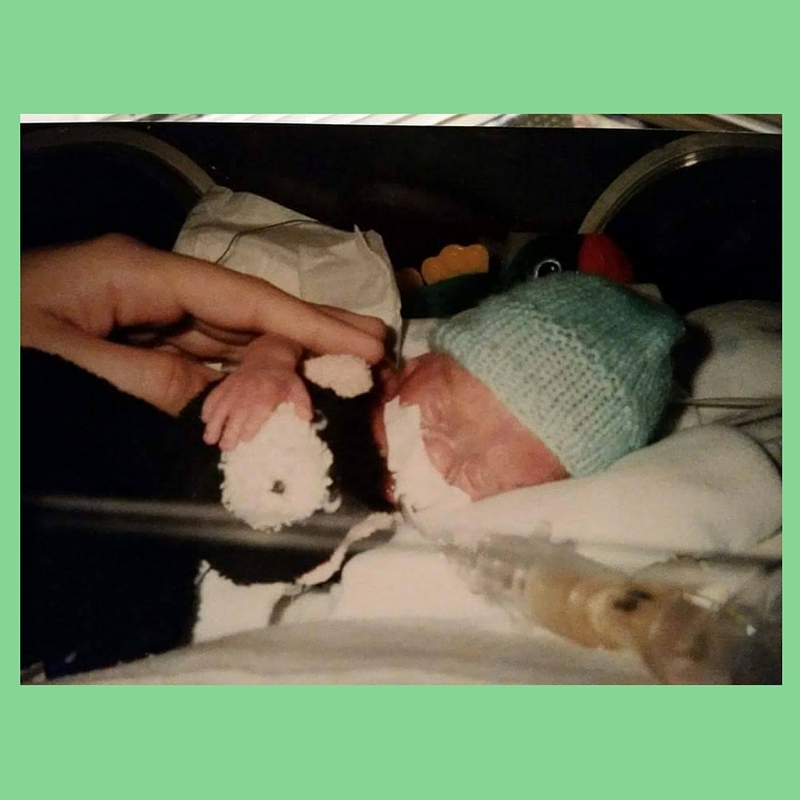 There was no easy accessible information on prematurity, and I knew no one that had a preemie even close to his size. I fortunately had a very positive attitude about his birth even when doctors or even my mother told me I needed a reality check. His prematurity was caused by what causes so many early births…Preeclampsia. It was very sudden from one doctor’s appointment to the next. There were no signs leading up to it. 4. How are you and your son doing today? Today my son is 19 years old. He graduated high school in May, and has a full-time job at a hotel. He will start a local community college in a few weeks and plans to study physical therapy. He is not able to drive because of poor vision and is very small but these are the only long-term problems from his prematurity. I was able to have 2 more children after he was born, and I was very lucky to have 2 daughters that were each born at 36 weeks. I had no major problems with either of those pregnancies. I’m not big on giving a lot of advice because I know every situation is so different. I would say that you’ve got to listen to the doctors. However, they are human and I think of it as they are making a forecast. They never really know. I was told several times my son would not make it, and I was told if he did he would be blind, deaf, never walk or speak. But I never gave up hope. I would also say not to put your baby in a bubble. I was never told to keep him away from people or family. I didn’t take him all over and of course people washed hands, but I never kept him in a bubble. He has been the healthiest of my kids by far! 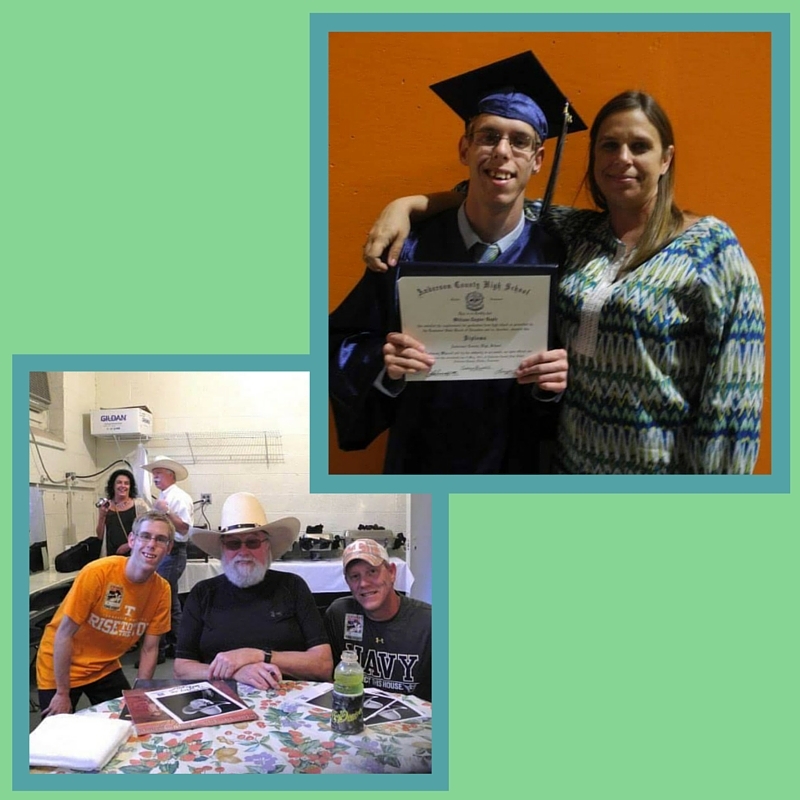 Thank you so much, Jackie for sharing your son and his story with us. I know it brings so much hope to those experiencing life with a preemie right now. You and your son are amazing! Incredible story. Thank you Shann for bringing these stories to us every week. So inspiring! I loved reading William’s story. He’s grown up into such a handsome young man. what a touching story and i have to say, although there are some small set backs, in comparison, what GREAT LEAPS your family has taken! I love your advice part – listen to doctors since so much is different from case to case. Happy to see that everything really did turn out in the end. Congrats to your family for staying strong during the tougher times, and celebrating the successes! Your series on premature births is amazing. It must give such comfort and hope to anyone going through a similar situation. 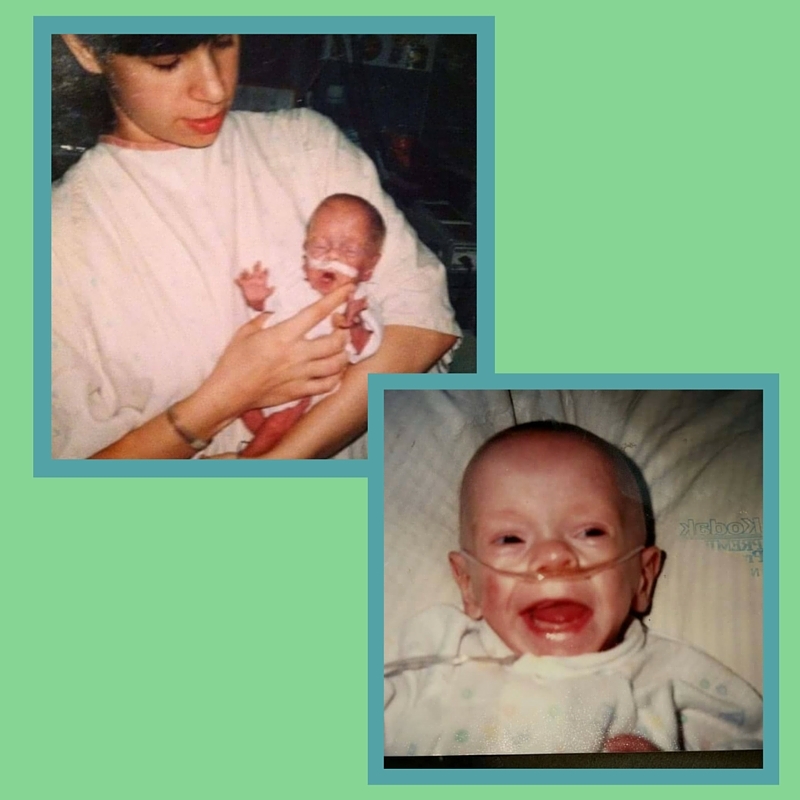 My aunt was a sub-2# preemie back when the technology wasn’t there. She turned out fine, but was one of the lucky ones. I love hearing how these premature babies are doing later in life. Thanks for sharing these amazing stories. He is amazing! So is his mom. I can’t imagine having a micro preemie at 18 and maintain a positive attitude. This series on preemies is awesome! Hi Jennifer, I just meant he’s one of the oldest to be featured on Micro Preemie Mondays. I’m happy to hear your Micro Preemie is doing well too. I love this story and seeing his progression! WOW! What an awesome and inspiring story. Thanks so much for sharing! This is really such a great story. My sister went through a similar situation as well. Such a great story! It’s awesome seeing how far William has come. Thank You so much for sharing. Love this story! And I love the forecast analogy. That’s pretty spot on! Touching story inspiring and hopeful for anyone …thanks for sharing. Yet another amazing story. Loved it! What an inspirational story. My niece gave birth to a premie about 7 months ago and we’re watching her grow, too (she’s up to 12 pound). I know there is success and happiness in your life and thank you for sharing it with us. WOW. Such an inspiration! It is cool to see how much the photos have changed! Truly an amazing story! Omg what a story!!!! Love seeing the grown pictures!!! Such a great series you are doing! Awwww such a sweet story! What an amazing story and a handsome young man. Oh my, such a touching story. William was such a beautiful baby. Thanks for sharing your story with us. My husband’s coworker’s wife just gave birth at that age–about 25 weeks. He was 1 pound as well. But, thankfully, his doctors said he is in the top 1% for survival. So good to hear. If they ever need any support, please let me know. My twins were born at 25 weeks, 5 days. Thank you for sharing this story! So awesome to see William grew up and graduated from high school, wtg! Amazing! What a joy to see! Thank you for sharing. William is a symbol of hope for so many! Looks like you have a great son there! What an inspiration to other mother’s in your same situation. Wow, that last picture is worth a million words. It was so inspiring reading how she had such a positive outlook even when people were telling her otherwise. Love it! He has such a beautiful smile! I love how fierce you were in your determination to not keep him in a bubble. Clearly your mom instincts were right! What a story, thank you for introducing this inspiring young man to us and God Bless him in all he does. I love reading inspirational storied like this. William is definitely a fighter. Hello everyone I’m Jackie and I’ve been blessed for the last 19 years to be Williams mom! Thank you all so much for the beautiful comments! He has been such a blessing to me from day one. I’m so glad that some of you with young preemies can now see that things don’t stay bad forever! What an incredibly touching story! She must be a very proud mama! I’m glad things worked out! These stories take me back to this time a year ago when I was fighting to keep my boys inside. Great inspirational story. I always tear up when I read these. I want to shout, Yay for William…Congrats for graduating, going to college, and having a job. I know you are one proud mama! What an amazing story. It is so good to hear stories like these can turn out so well. What an amazing story. I am loving this series on premies! 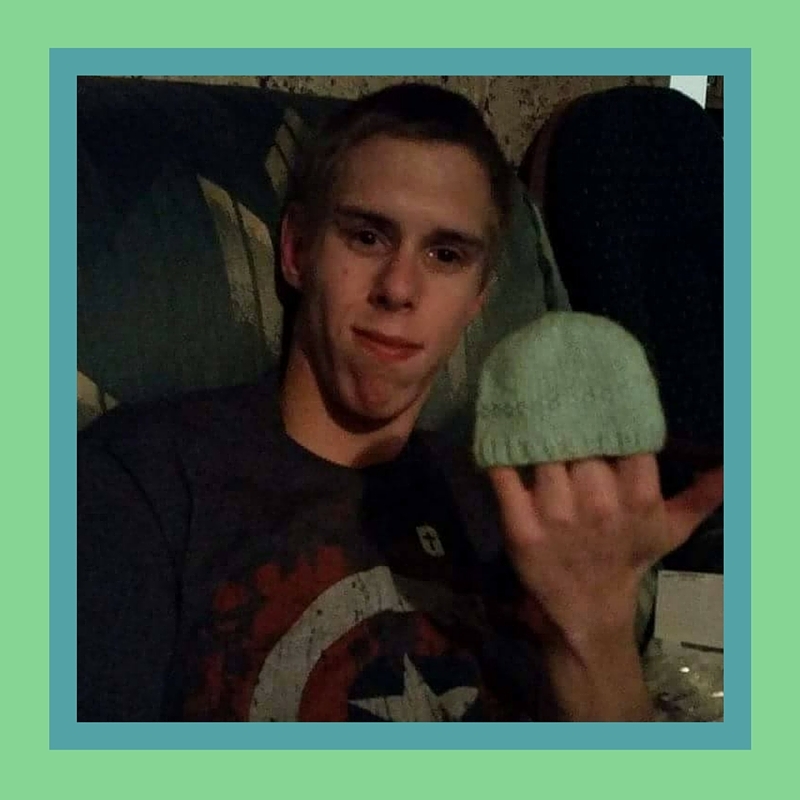 I love the picture of the 19 year old boy holding his premie hat! Lovely story! Congratulations on graduating high school, and best of luck in college. Sounds like you will do very well. What an awesome story, such an inspiration! 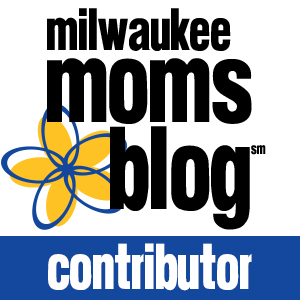 What an amazing story indeed of a little preemie whose mom never gave up. I so admit Jackie for keeping hope when other didn’t and at such a very young age as well. Kudos to you mama awesome job and what a beautiful son you have for sure. This is indeed an inspiring story. Thanks so much for sharing. Another inspiring story! So glad you have this series. Very touching story. Stopping by from The Blog Love Project. Beautiful, amazing what doctors can do nowadays. Beautiful story. And William is a miracle. I was in the NICU for a short time with my last baby. It is a holy place. All those precious angels getting better, waiting to go home. Lots of love! Oh such a great story. Love the pic of him and the beanie. So awesome. Oh wow! The photo of him with the beanie is amazing.